Here is another recipe that I am proud to say is my own idea. :) I seem to be on a popcorn spree right now, so I am trying out all sorts of concoctions using it. It’s oh so gooey, chewy and delicious! Pop both bags of pop corn and pour into a large bowl. Cut the tootsie rolls into small pieces (so that they will melt quickly). 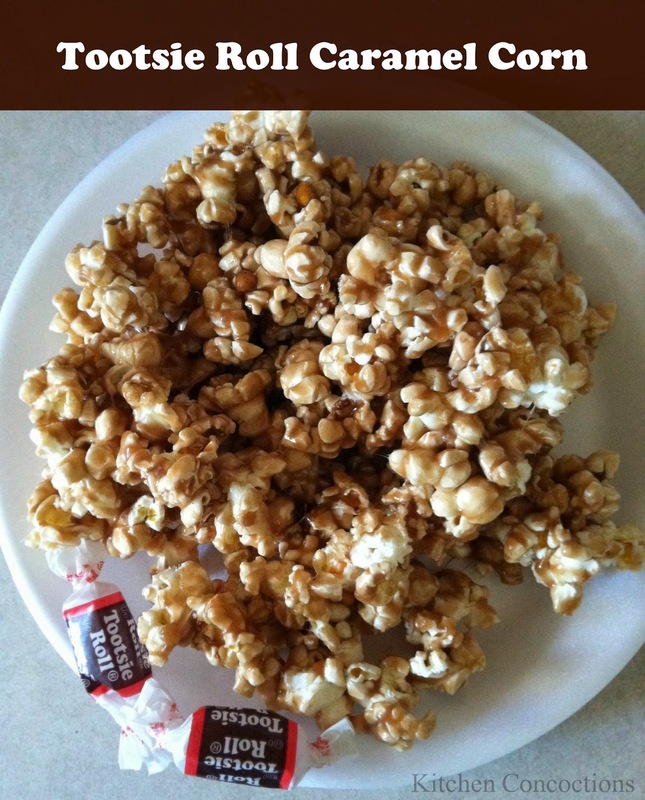 Put the corn syrup in a pot, followed by the brown sugar, butter, salt and chopped tootsie rolls. Heat over medium-high heat, stirring constantly. Bring the mixture to a simmer and continue to stir and cook until the tootsie rolls have melted. This should not take more than a minute once the mixture is simmering (at most). Then remove the mixture from the heat. Add the vanilla, stir, then pour over the popcorn. Stir to coat the popcorn. Allow the caramel to cool, or eat it in its warm goodness.